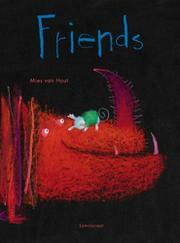 With only a dozen or so words and spectacular images, van Hout captures the landscape of friendship for toddlers through teens and beyond. The colors are jewel-bright on black pages, and each opening shows a pair of figures, usually a larger one and a small one, and a single word. They are animals or monsters or little gnomelike creatures, but they are all vibrantly alive. “Play” features a yellow four-legged guy in a striped sweater, and clinging to his ear and having a splendid time is a small teal poppet with horns, a tail and a ruffled scarlet dress. “Bore” finds a huge purple creature flat on his back with all four feet and tail in the air; splayed on his tail in a boneless posture of inertia is a small green-clad one. “Tease” finds a little yellow guy in a green dress shamelessly poking the nose of a very bristly beastie, while “fight” has creatures close in size tangled in jagged fury. There is crying and making up, embarrassment with very red cheeks and perfect “trust,” as a tiny figure balances on one foot on the blue snout of a creature with a great many teeth.